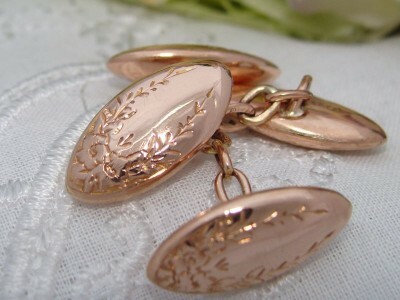 These Antique English Rose Gold cuff links are very sweet and would make a lovely gift. The pictures provide the best description – puffy, oval shaped buttons featuring a Forget-Me-Not floral and foliate wreath. Forget-Me-Not flowers signify true love, hope, remembrance and memories – Very Romantic. They are joined by chain links. Better-than-Excellent Antique condition. They're 100 years old with just a little wear and scratching commensurate with age – the pictures show it best. Priced at far less that you’d expect to pay in an Antique Jewellery store.